Questions about research? Find answers at the Research help desk. The research help desk helps you find information for your research assignments. We will help you articulate your research question, identify the best sources, and formulate your search strategy. We offer these services for students, faculty, and the community. We don't set up your computer or do your research and assignments for you. When you don't know where to start, or you can't think of what to do next, we can help. Answer your questions about library policies, procedures and services. For more in-depth help, book an appointment with a subject librarian. 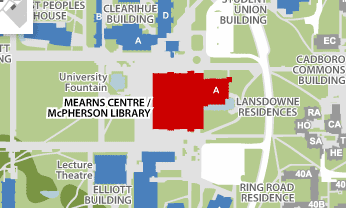 We have an office in the Academic Help corridor, Rm 135e. Hours are 10 am to 4pm Monday to Friday. Drop by or book an appoinment. For in-depth help, book an appointment with a subject librarian.